Ramped-up, rocking Motor City soul! 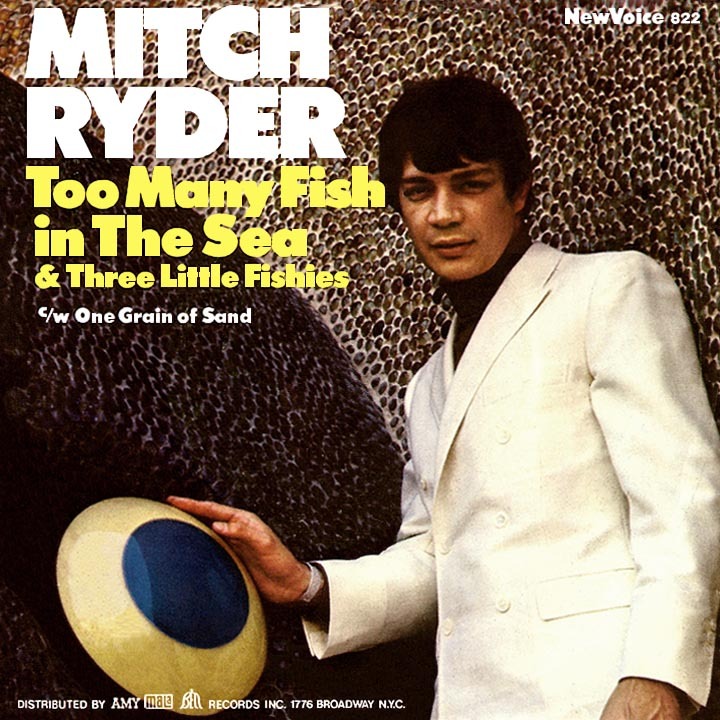 Mitch Ryder regularly took it to the limit, on record and especially onstage. Born with the unassuming name William Levise, Jr., he grew up in Hamtramck, the city with a small town vibe located near the heart of Detroit's metro area. Later his family moved about 20 miles north to the suburb of Warren, where young Billy regularly tuned in AM 1400, WJLB, for the hottest rhythm and blues sounds. Profoundly influenced by what he heard, and the fact that so much of it originated right there in Hitsville, U.S.A., the future Ryder set out to establish himself as an R&B singer in spite of his skin color. It quickly became obvious he possessed the chops to pull it off. While still in high school he sang with a band, The Tempest, a good way to get his professional feet wet in some of the area's nightclubs. Then he made a record under the name Billy Lee; "That's the Way it's Gonna Be" was written by a local reverend, James Hendrix, who pressed it on his gospel label, Carrie, in 1962. A black vocal group, The Peps (Tom Storm, Joe Harris and Ronnie Abner), took him on as a fourth member and the act became regulars at Detroit club the Village (where performers included future Temptations David Ruffin and Richard Street). Levise left the group to form Billy Lee and the Rivieras with former Tempest guitarist Joe Kubert (later, the post-Billy Peps waxed several sides for the city's D-Town label). At the Village he'd met guitarist Jim McCarty, bassist Earl Elliott and drummer John Badanjek, all fans of R&B. It was a good fit that would lead to high-profile but short-term success. "Won't You Dance With Me," a 1964 single by Lee and the Rivieras on the local Hyland label, gave no sonic hint as to what might come next. Afternoon personality Dave Prince of top 40 station WXYZ took interest in the band and forwarded a demo tape (made in Badanjek's basement with recording gear "borrowed" from the radio station) to producer Bob Crewe, an industy mover/shaker due mainly to his work with The 4 Seasons. Crewe signed them to his New York-based New Voice label, but insisted the name "Billy Lee" sounded country while pointing out the existence of Indiana's "California Sun" band called The Rivieras. Perusing the Manhattan telephone directory they landed on entries for several Ma Bell customers named Mitch Ryder, or so the story has been told more than once. The Detroit Wheels, a catchy-but-corny reference to the auto industry, completed the name. Bottom line: the guys consistently delivered high-powered performances, one way of doing their part to divert attention from the British bands dominating the rock music scene. Their summer '65 debut single, "I Need Help! (Help!, Help!)" (tripling the keyword from The Beatles' concurrent smash single and movie! ), despite its Detroit/N.Y. origin, sounded more like a southern recording from Stax or FAME with its overtly imitative horn section. The second single nicely duplicated the group's stage energy; "Jenny Take a Ride!" is more a mash-up than remake of two 1957 hits: Chuck Willis's take on "C.C. Rider" and Little Richard's screaming rock classic "Jenny, Jenny." Detroit stations put it at number one around Christmas; it hit the national top ten in January 1966 and paved the way for a top 20 follow-up, "Little Latin Lupe Lu," a disorderly take on The Righteous Brothers' three-year-old breakthrough hit that worked better onstage than on record. 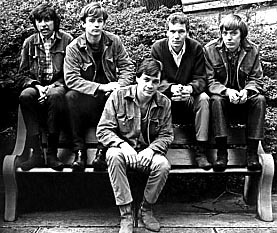 "Break Out," a Herb Bernstein-Gary Knight song, and "Takin' All I Can Get," from Crewe and Knight, showed off Ryder's spirited microphone technique but stalled in the chart's lower district. The cover of the fivesome's second album, Breakout, showed them standing on tires in an auto shop setting, which might have given the impression they were a hot rod band...a trend that had faded away about a year earlier. Any attempt at projecting a Motor City image seemed unnecessary; their music was intriguing at the least and, at best, electrifying. A new R&B medley paired a bona fide Motown song with another Little Richard scorcher and went against odds to become one of the most most durable hit singles of the mid-'60s. "Devil With a Blue Dress On" (an undeservedly low-selling effort by Shorty Long in '64) and Richard's "Good Golly Miss Molly," when combined, revealed decibel limitations in the best hi fi systems. It spent most of November and December 1966 in the top ten and was listed at number one on many stations' playlists, with top 40 outlets in Michigan once again leading the way. "Sock it to me!" could be the best-remembered pop culture phrase of the late 1960s, though it had been around at least a few decades ("Sock it to 'em!" was an auto sales expression, according to author John Steinbeck in his classic 1939 novel The Grapes of Wrath). Ryder can lay partial claim to its resurgence; "Sock it to Me-Baby!" hit the top ten in March '67. When Aretha Franklin demanded "Respect" a few months later, people began repeating the line more rapid-fire, then Rowan and Martin's Laugh-In landed on NBC's fall lineup and raised the profile of "Sock-It-To-Me-Girl" Judy Carne. 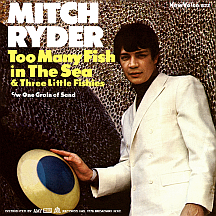 Another Motown tune got the medley treatment as the band (often following Bob Crewe's suggestions) welded The Marvelettes' '64 hit "Too Many Fish in the Sea" to the 1939 Kay Kyser-Ginny Simms-Harry Babbit-Ish Kabibble chart topper "Three Little Fishies" (or "Fishes," take your pick). They were relying too much on gimmickry and Mitch knew it. Crewe began a process of phasing out the Detroit Wheels, priming Ryder for a solo career, but it didn't work out as planned. "Joy" (composed by Ryder with L. Russell Brown and Ray Bloodworth) had a mid-chart run that summer and was followed by "What Now My Love" (on DynoVoice instead of New Voice - only Bob knew why! ), an overblown take on the Gilbert Becaud-Pierre Delanoe-Carl Sigman song that was a hit in '66 for both Sonny and Cher and Herb Alpert and the Tijuana Brass; the arrangement seems to have been inspired by Phil Spector productions like Ike and Tina Turner's "River Deep - Mountain High." Momentum was slipping away; further medleys like "Personality and Chantilly Lace" (mashing up the 1959 Lloyd Price standard with the 1958 hit by The Big Bopper) and "Ruby Baby & Peaches on a Cherry Tree" (The Drifters' 1956 Leiber-Stoller hit glued to a truncated Bob Crewe ditty) compared unfavorably to the more impactful "Jenny" and "Devil/Molly." Sending Ryder to Las Vegas with a big band was akin to mixing oil with water; he wasn't necessarily on board with every career decision. After the contract with Crewe had been dissolved, Mitch decided to stretch his musical boundaries, essentially turning his back on the sound and style of the hits that had made him famous. There was an album in 1969, The Detroit-Memphis Experiment on the Dot label produced by Steve Cropper with musical backing by Booker T. and the MG's (who'd been on a hot streak with hits like "Hang 'Em High" and "Time is Tight"), a notable improvement from the last of the Crewe productions. Reuniting with drummer Badanjek he formed Detroit, a decidedly harder-rocking outfit, and gained a little notice with Paramount Records singles "I Can't See Nobody" (a Bee Gees song) in '70 and "Rock 'n Roll" in '71, a solid track that nevertheless pales in comparison to the original version by Lou Reed. The following year, former Detroit Wheels Jim McCarty and John Badanjek formed The Rockets, a band that gradually developed a following and scored a hit in 1979 with a reconfigured version of the Fleetwood Mac track "Oh Well." Mitch dropped out of the business for a few years in the mid-'70s. Meanwhile, scores of radio stations continued airing "Devil With a Blue Dress On & Good Golly Miss Molly" in their oldies libraries while in Los Angeles, The Real Don Steele Show (formerly Boss City), a weekly music-and-dance fest on KHJ-TV channel 9, contained a segment, "Freak-Out Dance Time," with the in-studio dancers showing off their moves (and being pushed off-camera by wild man Don) while Ryder's hot 1966 hit supplied the beat, a routine played out on the show every Saturday evening throughout the early to mid-'70s. Ryder returned in 1978, recording and rocking out onstage as if he hadn't been gone. In 1983 he hooked up with John Cougar Mellencamp (feel free to subtract the "Cougar" or "Mellencamp" depending on which of his three professional names you prefer), who produced a "comeback" effort, Never Kick a Sleeping Dog, and its single, the Prince-penned "When You Were Mine." 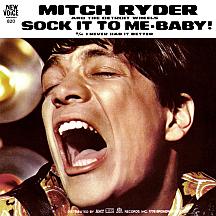 Commercially, the album fell short of expectations, but that didn't deter Mitch Ryder. Today he's still making records and, more impressively, setting stages ablaze with his high-energy performance style.